Heat Factory USA designed the following heated gloves and mittens with the serious outdoorsman in mind. Each and every glove and mitten is made to the highest quality standards that our customers have come to expect from Heat Factory accessories. Make freezing fingers a thing of the past with Heat Factory’s Sport’s Mitten (901). This comfortable heated mitten is made of soft fleece material and houses a secret pocket on the inside of the palm to house a Heat Factory Mini Hand Warmer. The Sport’s Mitten is purposefully over-sized to fit over golf gloves and baseball gloves. The palms have a coating of Rubberized Sure Grip to provide support while holding anything in your hand. Each pair of of the Sport’s Mitten includes one pair of Heat Factory Hand Warmers. Available in three difference sizes. 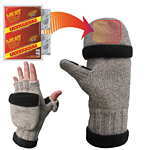 Heat Factory’s Heated Finger-less Fishing Gloves (920) have a pocket on the back to hold Heat Factory Hand Warmers. The material used is wind and water resistant for greater protection while fishing. The dot pattern across the palm and thumb allow for better grip. 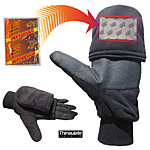 Each pair of gloves include two Heat Factory Hand Warmers (additional warmers sold separately). Available in four different sizes. Cold hands are a thing of the past with Heat Factory’s ladies fitted and Light-Weight Fleece Gloves (915) that have a concealed top pocket for an air-activated hand warmer. The index and thumb fingers have a conductive ‘touch tip’ material, giving you the ability to easily use a touchscreen device such as a smart phone, GPS, or tablet. Grip cold and wet items with confidence thanks to the honeycomb plastic texturing that lies in the palm. The exceptional freedom of motion in the glove’s cut makes it perfect for fishing, gardening, walking, camping and hiking. The Fleece Gloves include one pair of Heat Factory Hand Warmers (additional warmers can be purchased separately). Available in two different sizes. Stay warm with Heat Factory’s Pop Top Mitten (991) and the Heat Factory Deluxe Pop Top Mitten (992). The Pop Top Mitt’s cap has a specially-designed pocket to hold Heat Factory Warmers right under your fingers for ultimate warmth. The mitten houses quiet magnets that hold the mitten cap back and out of the way to free your fingers when needed. The glove holds an inner liner to give you comfort while the cap is folded back. The liner on the Deluxe Pop Top Keep your hands protected by combining the warmth of a mitten and the freedom of a glove that allows for free range motion of the fingers. The Pop Top Mitten comes with two Heat Factory Hand Warmers (additional warmers can be purchased separately). Available in three colors and four different sizes. Sizes range by color. Keep your fingers toasty warm with these fleece lined Ragg Wool Gloves (994); available in wheat color, and Olive Ragg Wool Glove (995). The Ragg Wool Gloves are designed to carry Heat Factory Warmers. They are the perfect combination of a mitten and glove for outdoor play or work in cold temperatures where you need occasional finger flexibility. Simply pull back the mitten cap to expose your fingers when you need to use them. The retractable thumb adds dexterity. Just pull back the thumb cap and expose the thumb whenever you might need it. The Ragg Wool Glove is insulated with ‘Thinsulate’. ‘Thinsulate’ provides maximum insulation with minimum bulk. The inner glove is lined with fleece for added warmth and insulation. The glove includes on pair of Hand Warmers (additional warmers can be purchased separately). Available in two different sizes Ladies & Men’s. No matter what size your store may need, we provide the largest selection of displays surpassing any warmer company in the business. Heat Factory Hand warmers are packaged in a self contained counter display that takes up very little counter space. The Lids folds up and has a pop up header. Check out all Heat Factory merchandising solutions here.